Janet: You know, when Andrea is able to walk, he's going to need some clothes. Janet: I thought I'd use some of the money Aunt Elizabeth left me to get him a new outfit. Ursula: Why not use our joint account? Ursula: Well, we're both responsible for him. And I was the one who saw him first. In a lonely house on an isolated strip of England's Cornish coast, two aged sisters endure a solitary existence. Practical and level-headed Janet (Maggie Smith) lost her husband 20 years before during World War I; the more emotional and sensitive Ursula (Judi Dench) never married, yet her soul still craves a spiritual connection. The two live out their days gardening and tending their land, making sporadic trips into town, and interacting with their crusty housekeeper, Dorcas (Miriam Margoyles). Nothing out of the ordinary ever happens to them... until a violent storm washes a young foreigner (Daniel Brühl) onto their private beach. 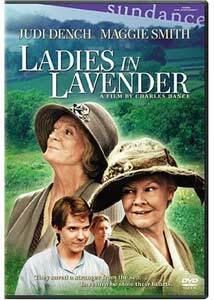 Ladies in Lavender tells the slight story of how this mysterious stranger impacts their desolate lives. Bed-ridden by a severely broken ankle, the young man convalesces for several months in the sisters' home, during which time they discover his name is Andrea, and he hails from Poland. As they nurse him back to health and teach him rudimentary English, Ursula finds herself bizarrely attracted to him. Years of repressed romantic longing come flooding to the surface, and though she never acts on these feelings, she seeks to hang onto them...and him. Ursula and Janet (in whom Andrea arouses more maternal instincts) innocently conspire to hide him from the rest of the world, but matters become complicated when they discover he's a virtuoso violinist, and a shapely young Russian woman (Natascha McElhone), who's renting a nearby cottage, has the connections to expose his talent to the world. Adapted from a short story by William J. Locke, Ladies in Lavender is more a vignette than a full-blown tale, and has trouble sustaining interest over the course of its 104-minute running time. First-time writer-director Charles Dance—best known for his acting in such films as Plenty, Alien 3, and Gosford Park—embellishes the plot and adds welcome atmosphere, but the leisurely pacing often becomes tiresome. Though it's impossible not to enjoy the performances of Dench and Smith, both of whom disappear into their roles, they can't completely rescue this fluffy trifle. Yes, deep emotions resonate throughout the film, and at times they're heartbreakingly conveyed. Dench and Smith know how to take small moments and attach enormous significance to them, but only a few such magical instances grace Ladies in Lavender. Still, it's a treat to watch these two old broads (and I mean that in the most complimentary sense) bicker, conspire, and comfort each other, and tackle roles that go against the grain of their established screen personas. Dench exhibits a lovely softness and vulnerability as Ursula, while Smith believably inhabits the more rigid, stalwart Janet. Unfortunately, Dance seems more concerned with constructing a beautiful movie than presenting a tight narrative. The opening sequences draw us into the sisters' world, but once the novelty of Andrea's arrival has worn off, there's little to sustain Ladies in Lavender during its middle third. Dance possesses a fine visual sense and nicely conveys various subtleties, such as the unease afflicting England during the mid-1930s (when Hitler rose to power in Germany), the local townfolk's tight-knit kinship, and the sisters' seclusion, but his whole never quite adds up to the sum of its parts. Some judicious trimming would preserve the film's essential atmosphere while heightening the story's dramatic impact. Yet for Anglophiles and lovers of fine acting, Ladies in Lavender surely satisfies. Dench and Smith always command our attention, and their performances alone make this well-crafted film worth a look. Image Transfer Review: At times, the widescreen anamorphic transfer looks slightly overexposed, resulting in a rather pale color palette, but it never compromises the beauty of the Cornwall scenery. The sparkling seashore, lush fields, and majestic vistas look splendid, and interiors enjoy fine clarity. Blacks are rich and inky, shadow detail is good, and no print defects mar the image. Audio Transfer Review: The DD 5.1 track is more active than one might expect, handling both subtle atmospherics and more bombastic sound with equal aplomb. A gentle breeze blithely wanders across the rear speakers, while the dramatic storm sequence employs all the channels to excellent effect. An annoying hollowness occasionally afflicts the dialogue, making a few lines difficult to understand, but on the whole, conversations are clear and well enunciated, and the climactic symphonic concert possesses solid dynamic range. Extras Review: The only supplement is a breezy, entertaining featurette, Ladies in Lavender: A Fairy Tale, which, among other things, compares the story's structure to that of a classic fairy tale. (I myself found the connection a bit flimsy.) Director/writer Charles Dance discusses the project's genesis, the Cornwall location, casting, and the alterations he made to the original short story, including significantly advancing the sisters' ages. Dench and Smith talk about their 50-year friendship and shared theatrical experience, and Dame Judi sings the praises of co-star Daniel Brühl. Some behind-the-scenes footage and clips from the finished film enhance this well-constructed 12-minute piece. A pleasant, gentle trifle, Ladies in Lavender boasts excellent performances from Judi Dench and Maggie Smith, but doesn't possess enough plot to fill its running time. Charles Dance shows promise as a director, but hopefully he'll get more out of his editor on his next picture. Fans of subtle drama will no doubt embrace this lovely little film, but those who enjoy a stronger narrative should leave these ladies alone.